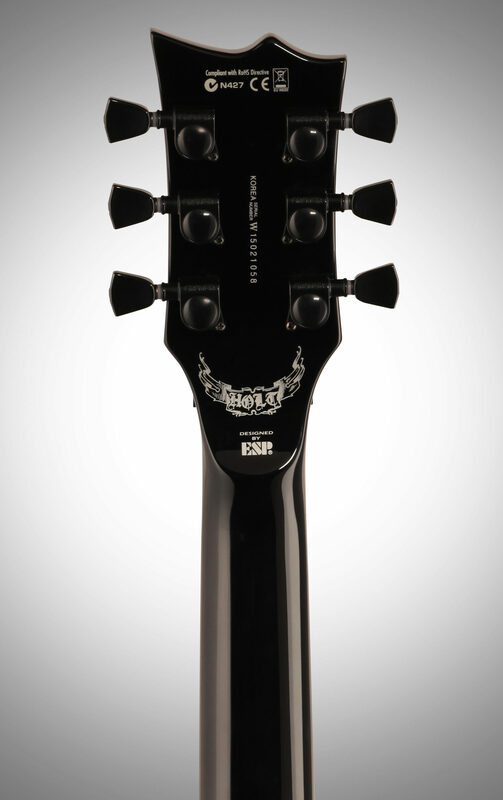 Feel your fingers fly their fastest with the ESP LTD Gary Holt GH-600 electric guitar. Before teaming up with Slayer, Holt made his name in the thrash band Exodus for 30 years. 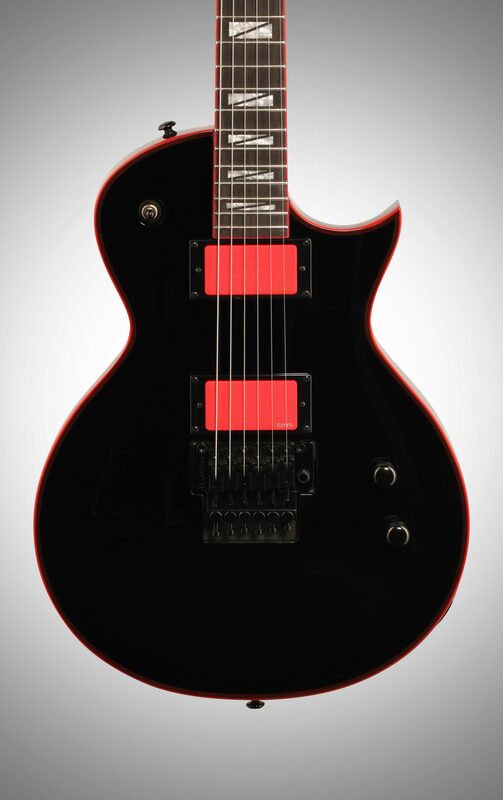 This signature axe brings Holt's force to your hands in thrash metal style, featuring a powerful and sleek EMG 89R and EMG 81R Red pickup pairing, a sturdy yet comfortable mahogany neck, a smooth and lightning-fast ebony fingerboard, and a flexible Floyd Rose bridge. Rocking ESP's iconic Eclipse body shape, this axe is an awesome combination of stark looks, amazing tone, and addicting playability. 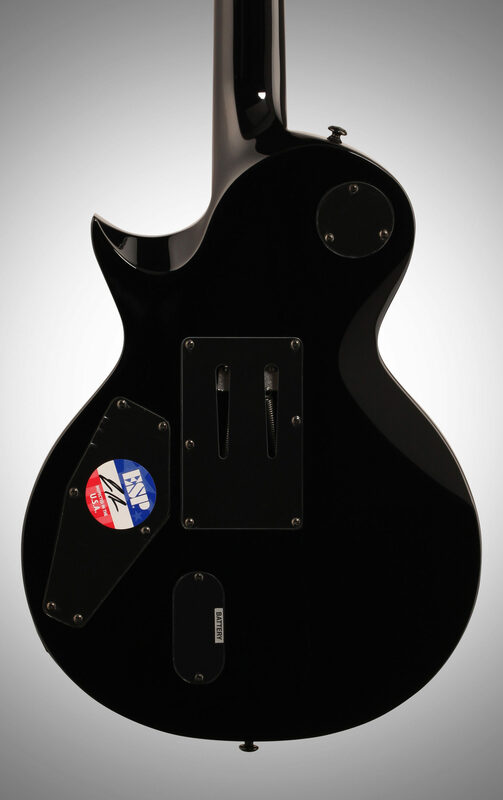 Plug in the ESP LTD GH-600 sound will resonate through and through with an ample helping of middle and low frequencies. Mahogany tends to keep things dark by pushing those lows, and you'll also never find yourself short on sustain -- a nice bonus when you flood your signal with gain and let that feedback grow. The Eclipse shape boasts a slick look, and it also allows you to reach those higher frets easily while resting comfortably against your front. Cool red binding adds an intriguingly colorful contrast. That wall-of-sound EMG pickup pairing is tough to beat. These active humbuckers will fuel your signal with a powerful metal tone that pierces through the air. The EMG 89R at the neck forges a slightly warmer output with plenty of body, while the EMG 81R at the bridge features that aggressive and powerful EMG sound heard from many different guitarists in the metal and thrash scene. Play around with your pickup settings and dual volume controls to hear the huge dynamic reach these two pickups can deliver on demand. A Floyd Rose tremolo bridge holds your strings down securely, while leaving enough flexibility to offer greater sustain and room for string bending and dive bombs. This bridge is a treat for the shredding guitarist. After you get your strings in tune, lock them down at the nut, and you can go on shredding for weeks without having to worry about losing any intonation. 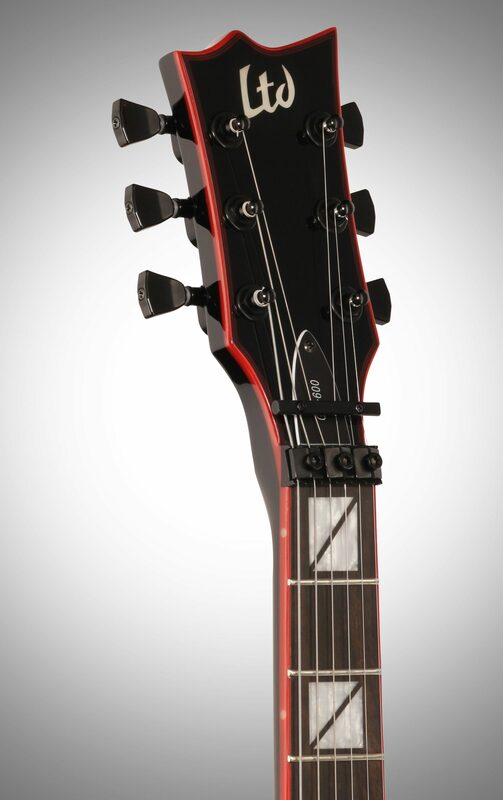 The mahogany neck on your Gary Holt GH-600 electric guitar features a comfortable Thin U contour for your hand to traverse with ease. 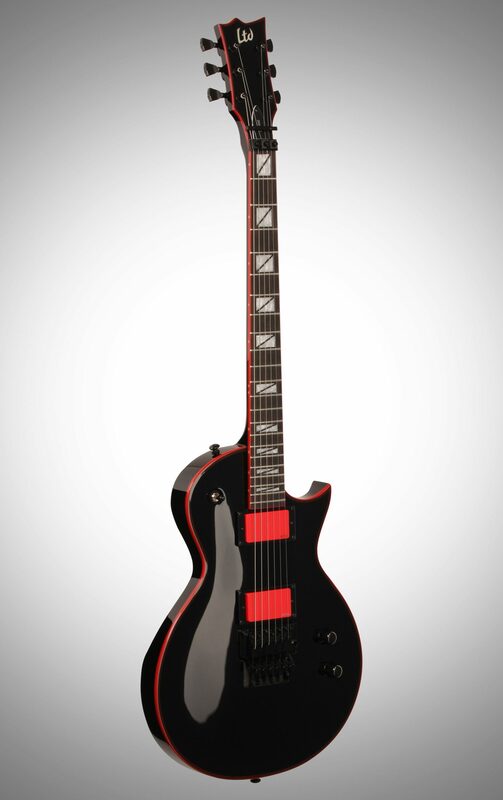 22 XJ frets span over a smooth ebony fingerboard which boasts a cool red binding and super tight action. 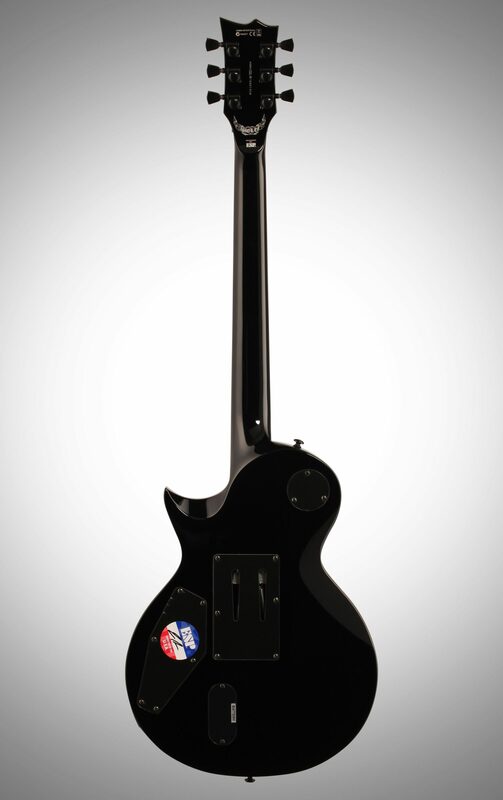 This neck is a perfect playground for your fingers to push themselves to the limit and see just how fast each note can fly from the fretboard to your amplifier. 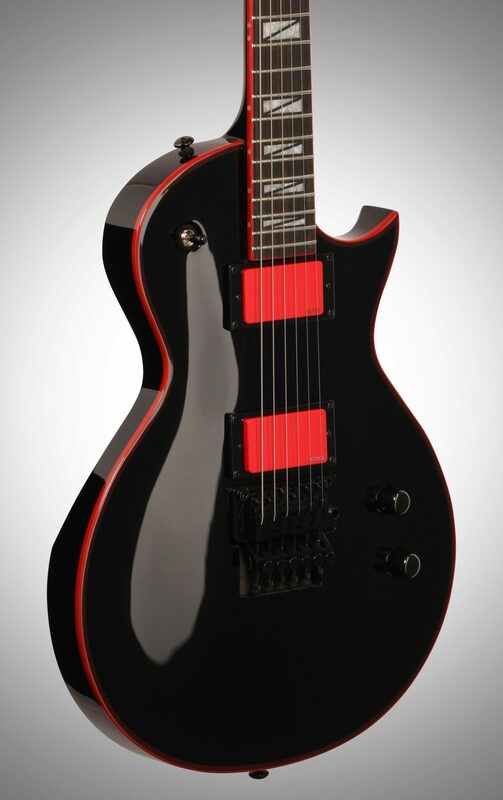 The ESP LTD Gary Holt (Slayer) GH-600 features set-thru neck construction, a 24.75" scale, mahogany body and neck, ebony fingerboard with 350mm radius, 42mm locking nut, Floyd Rose tremolo, EMG 89R Red/N, 81R Red/B active pickups, black finish, black hardware, Grover tuners. Overall: Just got this guitar in a few days ago and love it! Like my other LTD401, the neck is very comfortable and easy to play them quick licks. The red pick ups really pop out and the output is pure metal. This is as good as it gets for the thrasher. Overall: Incredible playability, Sounds amazing, looks Metal as Hell!...absolutely stunning guitar!